I think what makes SoulCycle such an unmatchable experience is that everyone comes into the studio with different stories. No matter what they are, our stories provide us with an intention behind each pedal stroke. These intentions then allow us to come together on a united front to create 45 minutes of magic, magic that creates change within all of us. My own story comes from a decade-long struggle with a drug and alcohol addiction, a struggle so deep I could not imagine myself emerging from it — until I found SoulCycle. 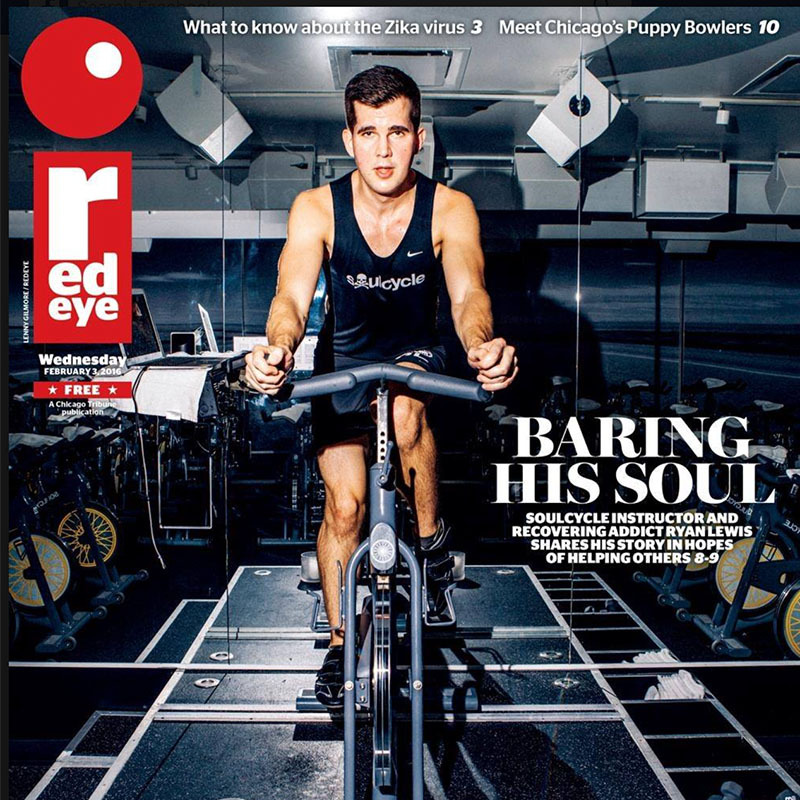 By chance, a local Chicago magazine caught my eye boasting a picture of the one and only Ryan Lewis, an instructor now based out of Philadelphia. This is where SOUL first came into my life. A professional server for all of my 20s, I wanted to be done with the day-to-day chaos I had created for myself — working all night, then partying into the early morning, only to go to sleep and repeat the process all over. I needed change, but I was too afraid to take the leap needed to do so. It took me about three weeks to muster up the courage to sign up for my first SoulCycle class. I remember the moment I walked into the Southport studio in Chicago, I had a feeling — not quite certain exactly what it was, but it was something I had not felt in a long time. A connection. This connection was everywhere. Even to the staff at the front desk, making me feel comfortable getting set up on the bike. I tend to be in my head a lot, over-analyzing every detail, questioning every decision. I remember for the first time in forever the ability to just let go of what I was holding onto that day. It was a release. I was surrendering to my struggles, and creating the strength I needed to overcome them. I was able to be present. It was a different kind of high, one filled with warm fuzzies, with goosebumps, with you name it — I had it all in that 45 minute class. It was a roller-coaster of emotions, an experience- but truly, an awakening. I knew after that class, just one week into my sobriety, I had made the right decision to clip in. I also knew from the moment I finished my first class I wanted to share the love I felt with all of my friends. Somewhere deep down, I knew I wanted to begin my journey to do this as more than just a hobby. Flash forward to one year later and here I am. Six months in on the schedule, and living my best damn life everyday. I’m having the time of my life, constantly asking myself if I’m going to wake up from this dream. I hope to do what Ryan Lewis did for me, that in sharing my story I can be of service to others in need of the courage to change their lives. One of my mantras in class is that “it’s about a feeling,” that very feeling I had my first time at SoulCycle in Southport. That SoulCycle is about igniting a fire in your life, creating a catalyst for positive changes to take place. It is about the bad times just as much as it’s about the good; those bad times help us to appreciate the good. SoulCycle is about giving yourself the warm fuzzies every single time you clip in. SoulCycle has given me the tools to make a change in my life, a change I will forever be grateful for. I’ve learned that the feeling I create in the studio, I can apply any time in my life so that whatever I set out to do can become a possibility. Thank you for helping me find it, SoulCycle. Thank you for allowing me to see my own worth; I love you. Catch classes with JOSHUA W. at North Shore and Southport. Want to ride? Grab a series HERE and book a bike.